I’m in a workshop at the Revs Institute in Naples Florida, home of Miles Collier’s remarkable collection of cars and all things automotive. I am with Paul Russell, car conservator and restorer, one of the all-time greats whose work on the most beautiful of classic cars wins prizes at concourses the world over. To one side of us is the stripped-back-to-raw-metal aluminium shell of a car – its styling shouts German, Mercedes, late 30s, into the war years. 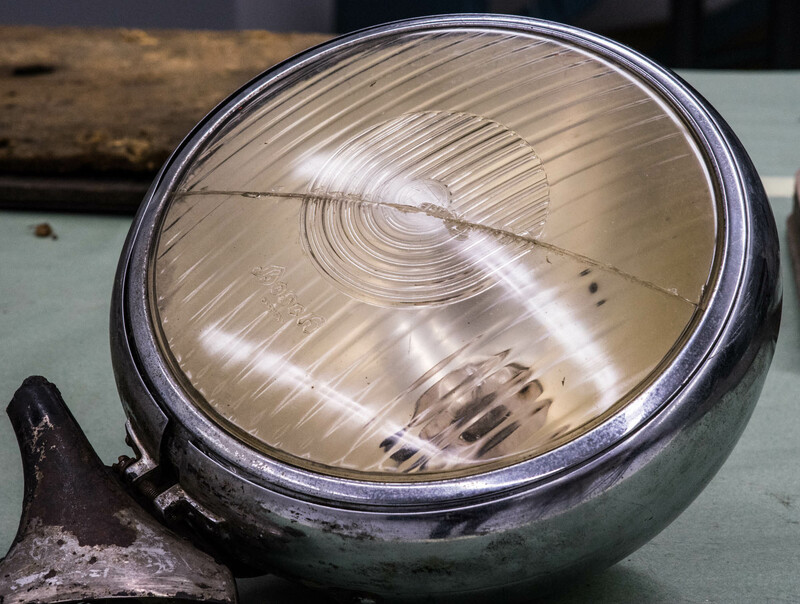 On the other side car parts are laid out – dashboard, instruments, wooden framing, steel plating, window glass, heavy window glass, laminated, yellowed with age, bullet proof. What is to be done with this ruin of a car? Paul tells the outlines of its story. Prague, May 1942. SS-Obergruppenführer Reinhard Heydrich, Reichsprotektor of Bohemia and Moravia, who answered only to Himmler and Hitler, “Hangman” Heydrich, was assassinated by Czech resistance. As well as frightful retaliation, the massacre of the village of Lidice, Hitler ordered 20 armored Mercedes Benz Innenlenkers, saloon cars, to help protect the most senior officials of the Reich. These were the model 540K Spezial Aktion Panzers. 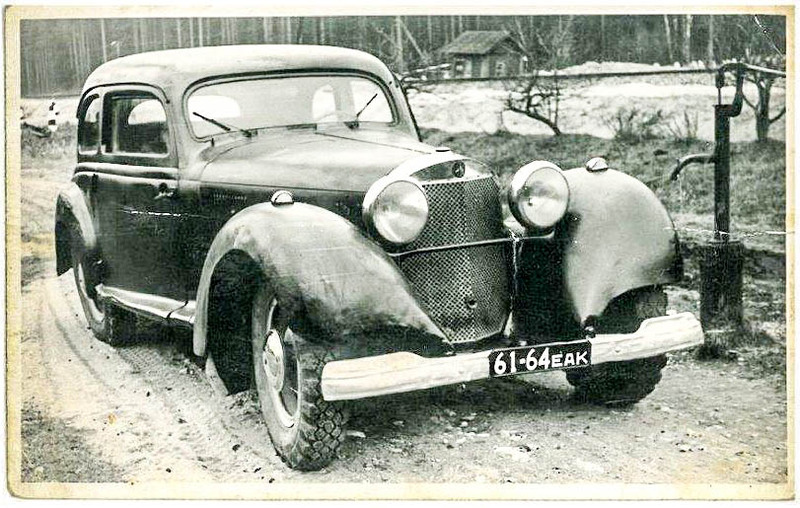 The car before us, chassis 408377, was delivered as a cabriolet in June 1939 to the HQ of Volkswagenwerk GMBH in Berlin-Grunewald for use by senior management – Ferdinand Porsche, Bodo Laffrentz and Jakob Werlin. It was probably the car that Hitler used on his visit in July to the new VW factory in Fallersleben (now Wolfsburg) – where the Beetle “peoples’ car” was to be built. Mercedes Benz didn’t have enough 540Ks to fulfill the Spezial Aktion P order that came from Martin Bormann, Hitler’s secretary, so they requisitioned 18 preexisting 540Ks for conversion. This one received a new armored body and was delivered in February 1943 to the car pool of the Reichskanzlei, the Reich Chancellery, the Government Headquarters in Berlin. 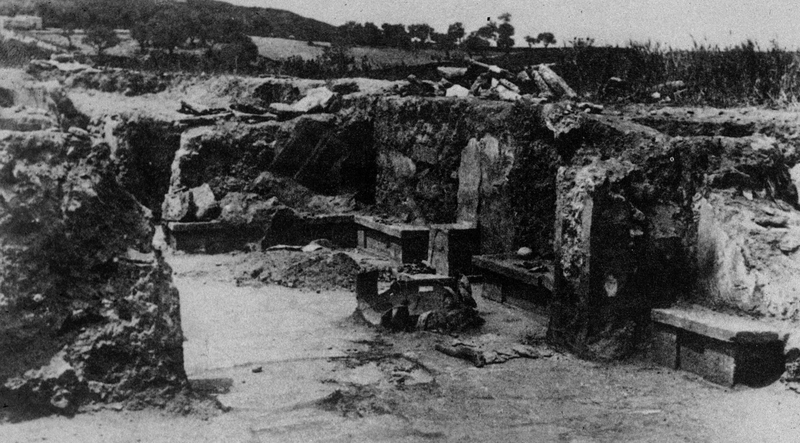 In January 1945 Hitler and his staff retreated to the Führerbunker under the Reich Chancellery. On April 20 the approaching Soviet Army started shelling Berlin in the last offensive of the war. Eva Braun, Hitler’s longtime companion, had been driven to join him in the bunker in early April. They married on April 29th and committed suicide the next day. Goebbels and his family followed soon after. Six days earlier on April 24th Hitler’s chauffeur had reported that most of the motor pool had been destroyed in the Soviet bombardment. Bormann tried to escape on foot, but also ended in suicide. This car survived. It was confiscated by the Soviet army and shipped east, along with many others. There’s a photograph of it with Russian license plates. These changed when it went to its last registered owner in Estonia in 1976. Sometime before this a Mercedes Benz 500K in Tallinn, Estonia needed a new engine and the owners arranged a swap. The 540K’s engine may still be with that other Mercedes. In 1981 the owner dismantled the car and spread the pieces across six barns on his farm. Did he fear that the car would be taken from him? How much did he know of its history? After the collapse of the Soviet Bloc in 1989 car collectors started traveling east in search of relics and rarities. The car was revealed to such an American in 1991 who recognized what it was, even though it was in a thousand rotting pieces. The owner didn’t want to sell — he said he had no need of the money, but agreed to trade the car for an education for his daughter in the United States. So the remains were collected and shipped to the United States via Helsinki in something of a covert operation to escape official notice and the attention of those making good in the political chaos, the “Russian Mafia”. The body was cleaned up and some restoration work started but soon stopped. After 22 more years in storage this Mercedes Benz Aktion P 540K #408377 sold at auction in 2014 for $765,609. On any account this is an unusual artifact. As Charlie Nearburg pointed out, no one will doubt the car’s historicity. First is the automobile’s influence on world history. We would ask if the particular car was a societal change agent like the Ford Model T, arguably the most important car ever built. 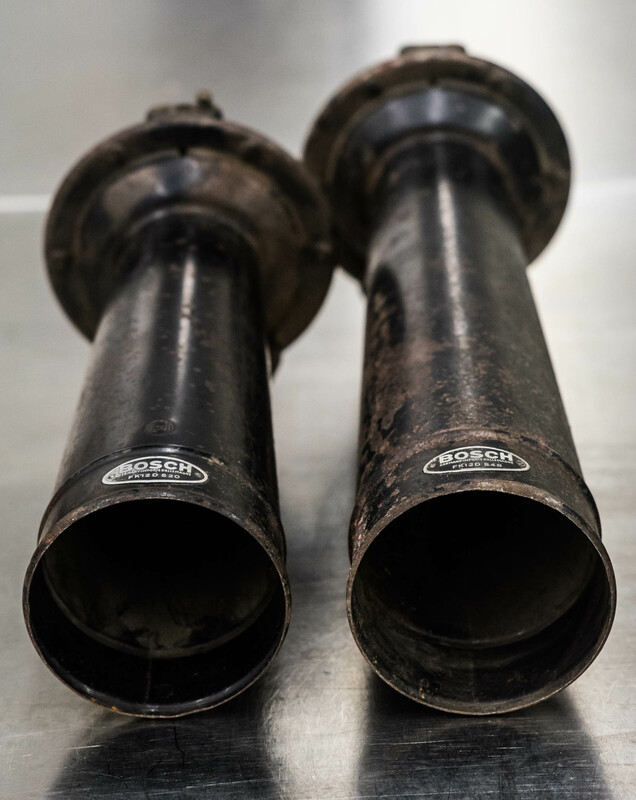 Then we would ask whether it incorporated some novel technology that forever transformed the design art of the automobile, as did the 1912 Peugeot Charlatan Grand Prix car, which introduced four-valve, double-overhead-cam architecture. We would ask whether the automobile was present at the time history was made. Consider the Gräf and Stift double phaeton in which Archduke Franz Ferdinand and his wife, Sophie, were assassinated on June 28, 1914, the proximate cause of World War I. Second, we would ask whether our subject was used to accomplish an important or celebrated feat: Consider the two-time Le Mans-winning Ford GT40. We could ask whether the car was generally notorious, say the 1933 Duesenberg “Twenty Grand” Rollston Torpedo sedan noted in the day for both style and astronomical cost. Third, we would ask whether the automobile was closely associated with an important or celebrated person. Consider the station wagon that Ansel Adamsused to take his Yosemite photographs – or one of Elvis Presley’s beloved Cadillacs. Fourth and last, consider automobiles that have become personalities through film: the Batmobile, or James Bond’s Aston Martin DB4. By these criteria, our subject Mercedes hits the trifecta of historic importance, association, and notoriety. Any Mercedes 540K is a noteworthy car by virtue of being the ultimate expression of Mercedes’ art. Its association with the KDF Peoples’ Car venture that turned into hugely important Volkswagen after the war makes our subject historically important. It is also associated with the KDF’s designer, Ferdinand Porsche, so we add famous personage connections to its role in history. The subsequent modifications into VIP transport for the Reich Chancellery in Berlin during World War II transform our subject car into a very rare artifact intimately associated with the power structure of Nazi Germany in a way that ordinary war materiel, say a Kübelwagen — or even a Tiger tank — are not. This machine occupied the heart of darkness in the same manner a desk from that same Reich Chancellery would have done. It gives us a frisson. The crack is visible in the photograph above. Bullet proof rear window, passenger side, reflecting remains of the dashboard. Some of this reaction undoubtedly relates to the connotations of such a vehicle. One of the two other remaining Aktion Ps, now in a museum in Prague, was used in the movie “Schindler’s List” that took us into the human horror of the holocaust. It’s the kind of car we associate with the Nazi villains in “Raiders of the Lost Ark”. We are all too accustomed to the movie archetypes of Nazi evil, and, more broadly, the material culture accoutrement of totalitarian regimes, or of Kafka’s nightmares. The confrontation with something as mundane as a leather seat yet transports us quite elsewhere. This car was there back then (this is a key energy in an archaeological sensibility). These things have endured. This window yellowed with age connects us palpably with grainy images from a newsreel or a black and white photo from back then. This is a time machine. Because these are mnemonics beyond personal memory. In the connection between a pane of glass or a seat and those last days in Berlin, it is revealed that history is actually so close, not distant, but within us. These remains remind us that history is most often experienced as banal, so close to us, yet so distant (this, I recall, is Benjamin’s definition of aura). It’s mundane – history is so close and everyday it really can happen to you. The worst can sweep you up too. The car has endured, a witness to that characteristic of modernity we all experience – the juxtaposition of the utterly mundane and banal with the spectre of war, apocalypse, financial collapse, terror attack, global climate meltdown. As you drink your coffee in Starbucks notification arrives on your smartphone of another atrocity in a far off city. I have elsewhere shared my concern with the way ruin can become attractive in itself [Link]. 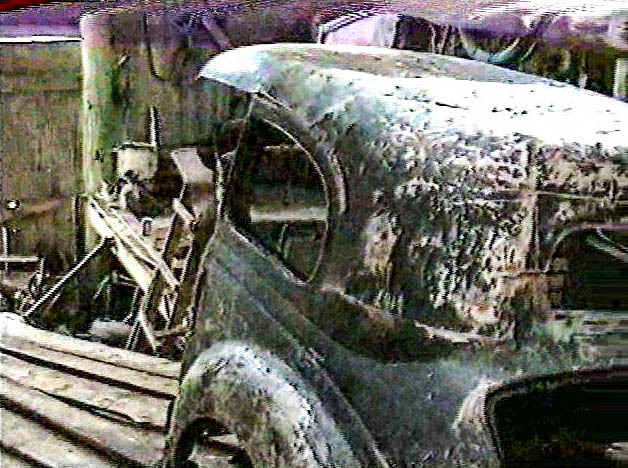 [Link] The story of the discovery of the car in rotting pieces in a farmer’s barn may involve such an aesthetic – this is the romance of the ruin of history. This can easily decline into superficiality. 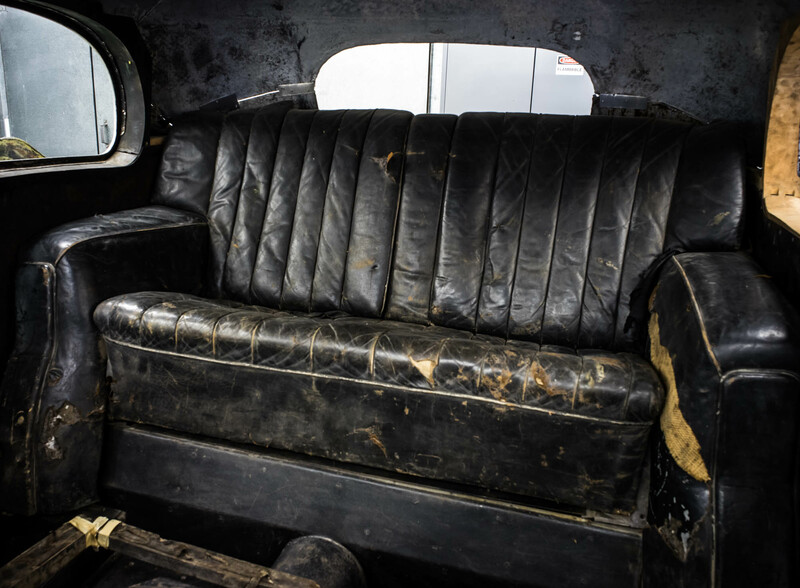 The patina of history, the worn seat, the chipped paint of a car, testament to time, can be very appealing – in itself. The confrontation with a cliff edge, looking over the edge of a volcano into nature’s chaos and experiencing the sublime can be turned into something picturesque and far from disturbing. Medieval castles in Europe, the architectural core of feudal order, suffered the fate in the eighteenth century imagination of becoming picturesque ruins, follies and settings for bestselling gothic novels. There’s also the related temptation to divert the haunting, warning, threatening remains through kitsch. This can take many forms. Consider, for example, the option of restoring this car to its 1945 condition and placing mannequins of Hitler and Eva Braun on the back seat. 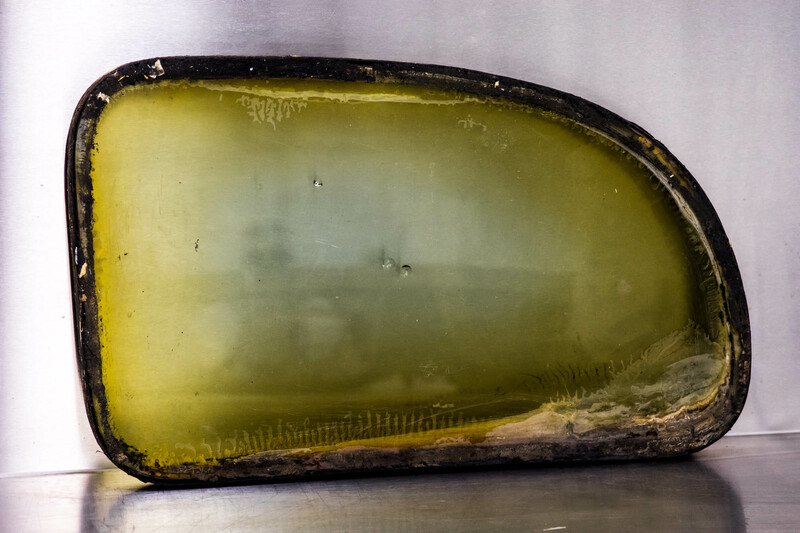 The aesthetic of remains includes crucial ethical questions of taste. And remains can become memorabilia or hallowed relics – the focus of celebration. 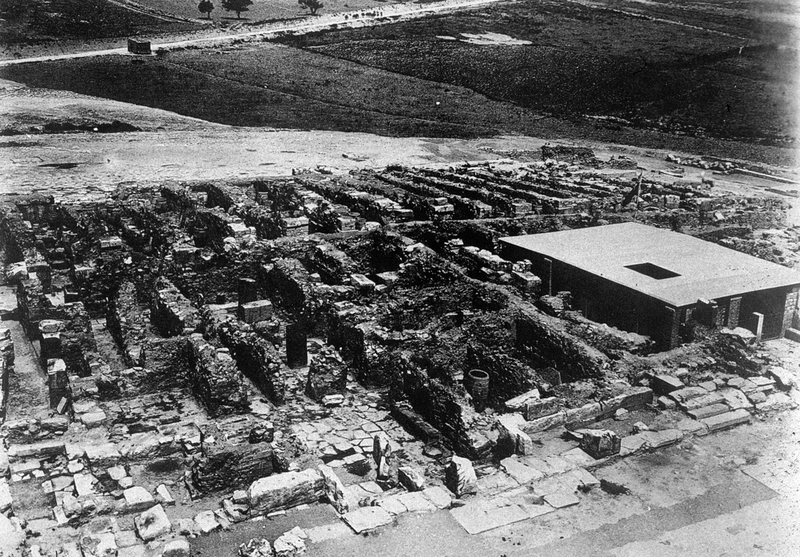 After the war the Soviet authorities were rigorous in attempting to completely destroy all remains of the buildings of the Reich Chancellery, leveling the ground, even disinterring the remains of Hitler and the other suicides that they might be completely burned away, removed from history. This severing of material connection is, of course, rooted in the same recognition, an archaeological one, that things can be very powerful connecting agencies that deliver meaning and significance. The Estonian owner couldn’t let go of what was no longer a car – to the point of breaking up the vehicle and spreading it round his farm. These are the issues of conflict heritage – the way past conflict and trauma linger to pose awkward and disturbing questions. So what is to be done with these remains? Here we return to the technical arts and magic of the conservator and curator. I asked Paul what was possible. Perhaps a third of the 540K is missing. 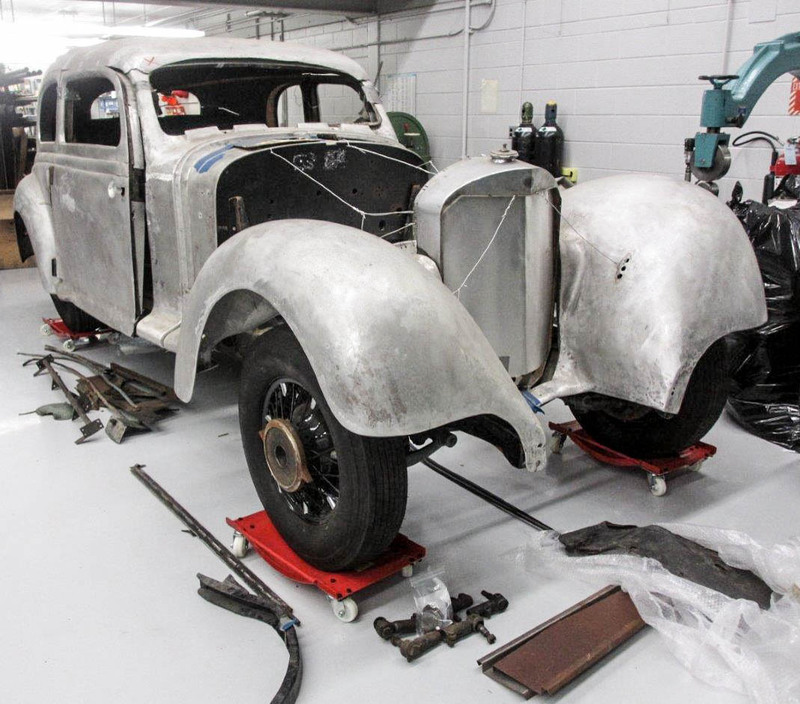 But with a donor car to supply parts, his craft could deliver a restored vehicle. This would, of course, remove the link with the past that comes through the car and its components having endured, ending in so sorry a state. For Miles, such a restoration would erase the historical document that the car has become. Steven Harris said just leave the car alone – it’s enough that it is with us. Surely, nevertheless, this is an artifact to be shared. Does it not ask to be displayed? I commented to Paul that it was like an incomplete disarticulated skeleton, as we so often deal with in archaeology. Paul suggested it shared something of the fascination of a dinosaur fossil – a sublime experience of the abyss of time as well as glimpses of where we have come from, even a warning we might be more humble in our assessment of the success of our species. The genetically reincarnated creatures of Jurassic Park aren’t the kind of option available to the car restorer, though digital reanimation can be very lifelike. Crucial is offering context and information to augment and offer commentary on the remains – that we might understand them, that they might speak to us. Might we offer an “exploded view” of the car – parts arrayed around the shell, blasted apart, testimony to disarticulating time and history, but offering an experience of material construction? Do we not need more – the supporting documents such as that invoice sent to Bormann, or the blueprints, the couple of photos of the car after the war, the videos of the discovery in the barn, the loading of the crates onto the Boeing 747 in Helsinki? And more – where might the essential connections and contexts stop? How could Paul effect such a composition? 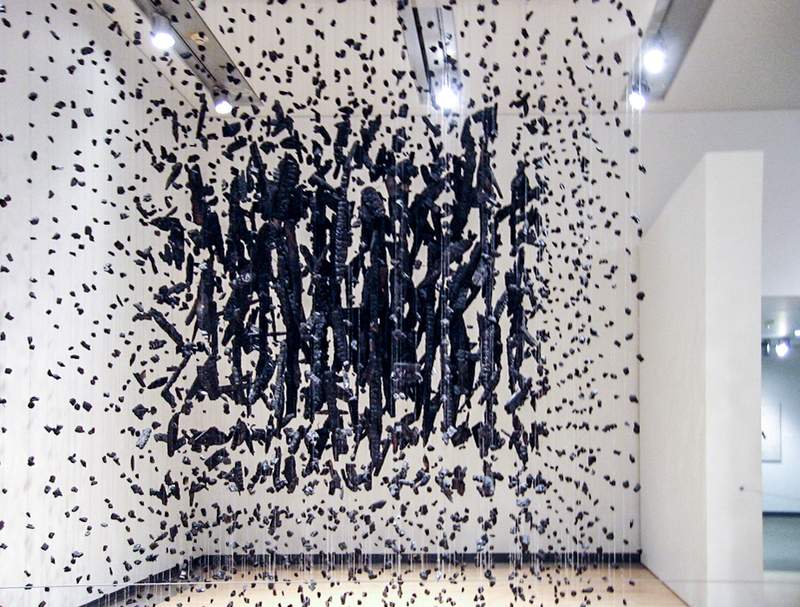 Cornelia Parker – Anti-Mass, 2005 – charcoal and wire – remains of a Southern Baptist church destroyed by arsonists. This is the role of the curator – to work with the conservator so that the remains will endure and be enabled to make manifest what they’ve been through. Does conservation here not beg for sensitive reconstruction? Does restoration here not demand a fresh notion of active and supportive intervention. That the car may speak, as document, as a far-from-mute witness to the twentieth century. Conservation and restoration here may approach more the character of (re)composition, where composition refers us to the fictive – making good the loss, but not so much by filling in the gaps, as by using the gaps, as negative space, to tell a deeply human story. Fiction, fictive recomposition, as pulling together the pieces so as to evoke – this is how Miles expressed it. Otherwise we have decayed remnants that say little except to the cognoscenti, appreciated perhaps more for their alluring patina, or the conventional restoration that depends upon sterilizing the past. 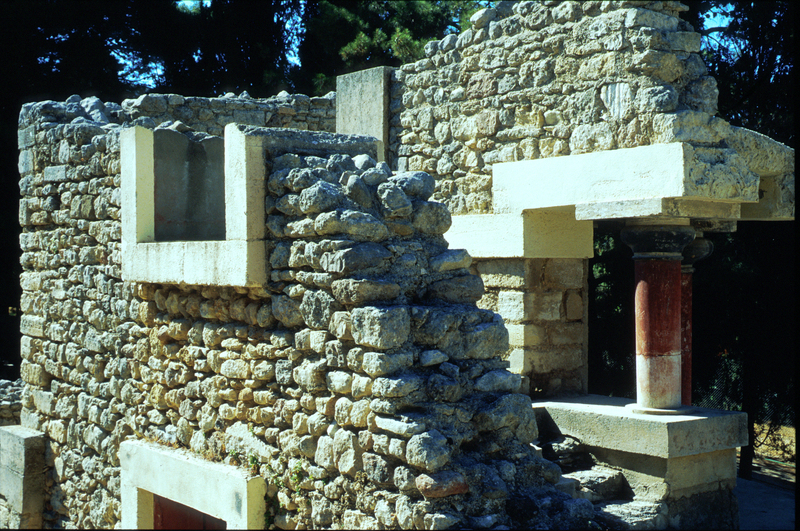 In the early years of the twentieth century archaeologist Arthur Evans discovered a lost civilization on the island of Crete. 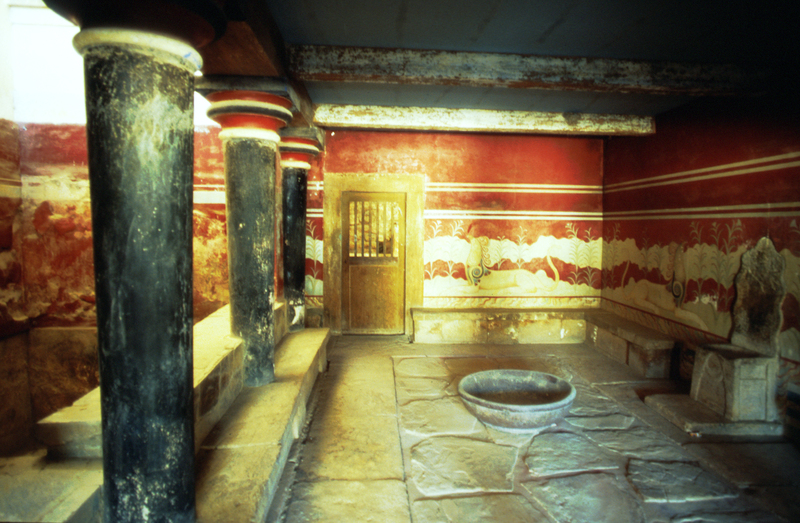 In a couple of field seasons he revealed the remains of what he called, with some good reason, Knossos, the palace of the mythical Minos. But the winter rains immediately began washing away what had lain safe for more than three thousand years. He made a daring and controversial decision to arrest the decay and open up the ruins to interpretation by rebuilding the palace, but not in the way the palace had been. He partially rebuilt as an amalgam of consolidated ruin and restoration. Before – a roof arresting the decay. After – fictive recomposition, on the preserved actual foundations. Steven rightly pointed out the problems with this – the reconstruction says more about Evans than the world of prehistoric Crete. But the juxtaposition of before and after is powerful. [Link] [Link] Would it not be something to have the untouched remains of this survivor alongside the complete Aktion P in Prague? Or an amalgam, within this very vehicle, of restoration and consolidation. The stripped aluminum bodywork, product of a hasty and aborted start at restoration in the 1990s, is jarring and inappropriate. A coat of black primer? I think of the debates about art restoration at the end of the eighteenth century. The sculptures from the ancient temple on the island of Aegina received a serious clean up from the chisel of Danish sculptor Thorwaldsen. Elgin was looking to do the same with the marbles from the Parthenon in Athens, until taste changed and they became untouchable relics. 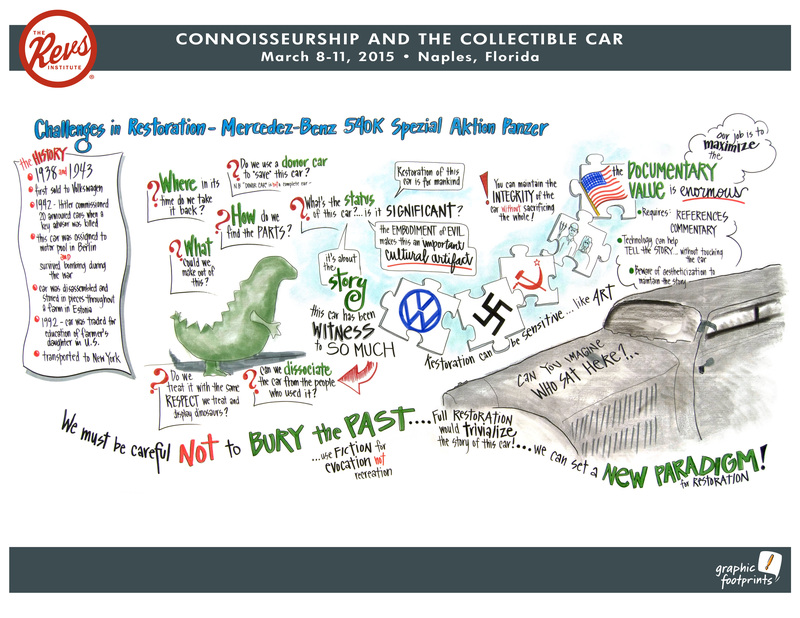 We are at the beginning of a new paradigm in automotive restoration and conservation. 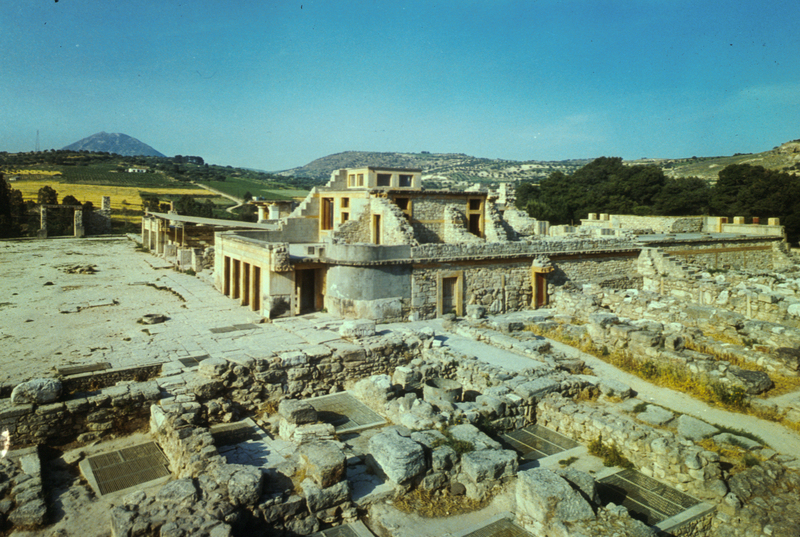 Michael, I enjoyed this article and your comparison of the 540k to the ruins in Crete. As you know, I too, fully believe we are “at the beginning of a new paradigm in automotive restoration and conservation” and the advent of the autonomous self driving car will hasten this shift. Nice info-chart illustration too! It seems to me that an automobile was originally created to perform a mechanical task. To transport man. Therefore, any automobile and its function, aside from its historical significance and its place in historical events, was meant to operate. Everyday automobiles are maintained to function not knowing what their future past might be. Had the 540K seen a different “salvaged” history, i.e., the salvager maintained its operation for their needs, would we then be looking at maintaining that altered operation as found? Like an ancient mechanical device, would we not at least keep it functioning as to its original intent? Maybe its non-functioning parts would be left alone, but its created purpose would best be maintained as an operating device. Because an automobile requires replacement of wearing parts, fluids, tires, etc. to keep it functioning, why would we not do the same? I am not saying restore the 540K by any means, but should it not continue to at least operate and perform as intended even without its complete body parts, interior components or non-operating essentials, or where its historical events took it through time? If Mr. Jefferson’s Monticello needed a roof, would we not repair because that would not be original? If the salvager had no knowledge of its history and maintained the automobile and also made some modifications to suit their purpose, would we upon discovery and acquisition then begin to remove those changes, or would those changes be left alone as part of the history? I think that the acquisition is incomplete and that if remaining parts and engine exist, their acquisition need to be pursued. Even without this, it is an automobile not intended to be static lump, its purpose was to transport and function as a mechanical device. Not having it at least operate as created, and operation maintained as intended, just makes it… well it is like when you drive along a road and there is this cast iron sign along the road and it says, ” At this place something happened ” and you look and see some space. That is the 540K not running.